The puzzle below has been corrected. See here for a highlight of the correction. The puzzle can be found in this printable PDF, or in the image below. I’m happy to announce my first e-book release on this blog! I borrowed an idea from David Millar, whose Area 51 puzzles combine clues from Slitherlink, Fences, Cave, and Masyu. I wanted to see how far I could take this idea, layering as many types of clues as I could into one of my own puzzles. This collection of 20 puzzles introduces 8 different types of clues and explores how they interact with each other. Most of these puzzles are Hard to Expert difficulty, so expect a challenge. If you would like some easier puzzles to start out on, check out the original Trapezoids post from June. The content of the e-book in blog form follows, except the solutions. Shade some cells such that numbers indicate exactly how many surrounding cells are shaded. Shaded cells must be in edge-connected clusters of 3, forming trapezoids. A trapezoid may not share an edge with another trapezoid. All remaining unshaded cells are connected edge-to-edge. Some shaded cells are given. Cells with single or double circles must be unshaded, and thus must be connected to the remaining unshaded cells. Cells with a single circle must be touching exactly one shaded cell. Cells with a double circle must be touching exactly two shaded cells. Numbers on the outside edge of the grid indicate the total number of shaded cells in the indicated row. Only shaded cells, including givens, are counted. Dots on the border between two cells indicate that one cell is shaded and the other is not. Some shaded cells are given, marked with an X or Y. EITHER all of the cells with an X have one neighboring shaded cell and all of the cells with a Y have two neighboring shaded cells OR all of the cells with an X have two neighboring shaded cells and all of the cells with a Y have one neighboring shaded cell. Trapezoids cannot cross interior borders. The interior borders create regions, each of which must have at least one shaded cell. Interior borders do not block unshaded cells from connecting. Large black dots inside of a cell represent obstructions, which block unshaded cells from being connected. Additionally, obstructions cannot “see” each other; in any row of cells in which there is more than one obstruction, at least one of the cells between them must be shaded. Just like in row counts, a row of cells is either 0° (horizontal), 60° or 120°. Obstructions must be connected to the mass of unshaded cells. Obstructions are not counted in row counts. For my 100th puzzle, I’ve made my first giant: a 36×20 Moon or Sun. I’ve been working on this one incrementally over the last two months, so it’s a bit of a hodgepodge. This is a fun type to work with, though it can be challenging to prevent uniqueness-forces from giving away the solve path. Killer Sudoku rules apply. Instead of 3×3 blocks, the nonets (bold-outlined groups of 9) are differently shaped. These bold-outlined groups must contain the digits 1-9 without repeating. 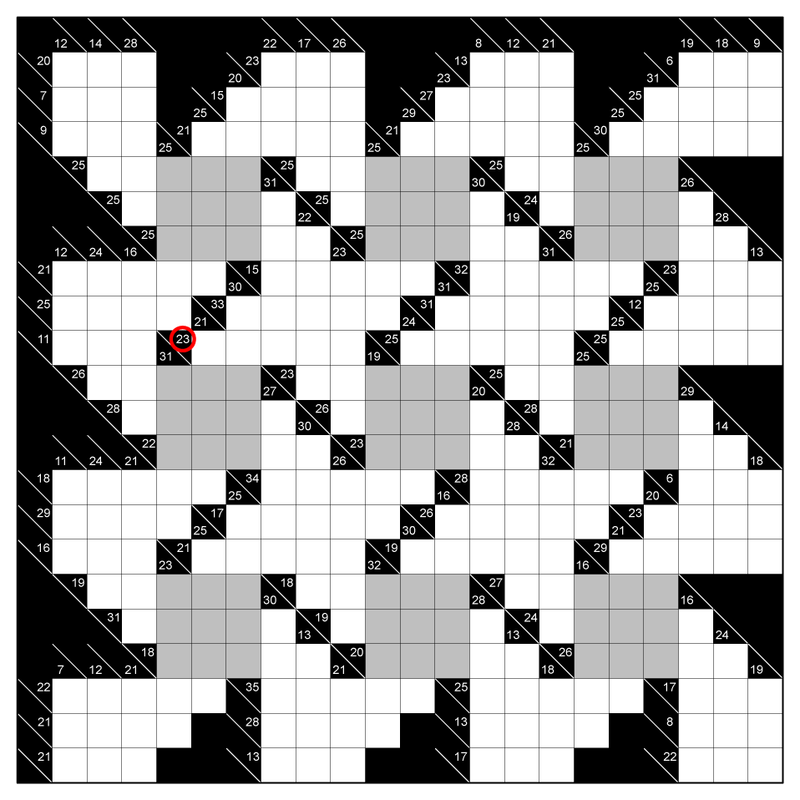 In addition to standard Killer Sudoku rules, no two cells a knight’s move [2,1] away from each other can be consecutive. For example, a 5 cannot be a knight’s move away from a 4 or a 6. In addition to Standard Killer Sudoku Rules, no two cells a knight’s move [2,1] away from each other can have the same value. Paramesis Puzzle Blog Blog at WordPress.com.